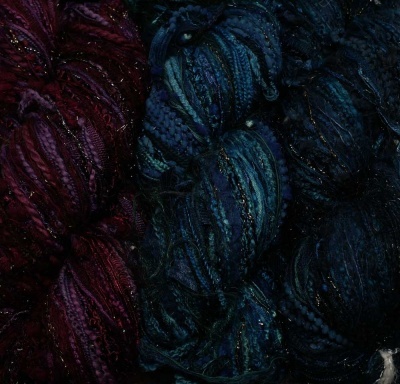 We brought in some gorgeous Prism Yarn's "Stuff" in three Layers colorways. Very very very low quantities of each are left however; hence they join our Orphan Skeins. Layers is defined by Prism as complex colors that are dyed one at a time over one another. The result is non-pooling, non-striping, subtle overlays of color upon color, with both parents visible as well as every combination between the two. Prism is the exclusive manufacturer of Stuff Yarns™. Thirty to Forty individually hand-dyed, color and gauge-coordinated yarns that are tied together end-to-end by hand. When knit, the yarns change from one to another in varying lengths. Our newest offering takes Stuff to a whole new level. Each of our 45 Layers colors are available in this updated take on our venerable favorite. Layers Stuff is similar in composition to Wild Stuff, but has no eyelash. 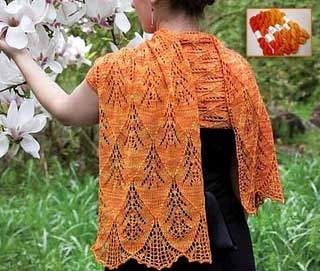 You will find plenty of texture and glitz, plus a generous 300 yards in a full skein or 150 yds in a half skein. Our family of Stuff remains the standard toward which other hand tied yarns strive. The colors are glorious; combining our carefully chosen palettes allows you to create with Stuff in a way you never could before. Each of these is technically a half, a 3-4 oz skein of 150 yards. It is made up of varying fibers including rayon, cotton, nylon, kid mohair, bamboo, tencel, wool, cashmere. It will give you roughly 4.5 sts = 1" #8 needle, though it can be knit tighter or looser as well. 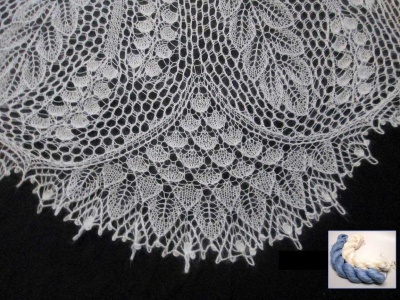 It is marvelous to add a special edging to a shawl or hat or pullover or jacket. The colors are rich and really gorgeous. 1. Juniper: jewel-like teals and blues, a winter evergreen forest at twilight. 2. Garnet: a velvety combo of violets and purples, the inside of a gemstone. 3. Indigo: deep and rich teals and indigo, a night sky after the sun has set.